If any contemporary author has the goods to pull off a variation on Dickens, Carey (The Unusual Life of Tristan Smith) is certainly the man. With great panache, he executes an abundantly atmospheric and rollickingly entertaining reprise of Great Expectations. In 1837, a mysterious man--hulking, silent, missing two fingers--steps off the coach in London. His name, we eventually learn, is Jack Maggs (read Abel Magwitch), and he has illegally returned to England from Australia, where he was brutally used in the penal colony. He's a dead man if discovered, but he's obsessed with finding his (adoptive) son, whom he's been supporting for years--facts we glean in small, suspenseful increments. Circumstances propel Maggs into the home of Sir Percival Buckle, where he is quickly employed as a footman, and where he catches the eye of a saucy chambermaid with a tragic past. An attack of tic doloureux brings Maggs to the attention of ambitious young writer Tobias Oates, who employs the newly fashionable ""science"" of animal magnetism to draw out the ""phantom"" in Maggs's subconscious that is causing the pain. 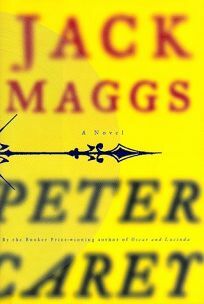 Under hypnosis, Maggs reveals some of his secrets, and Oates determines--without informing Maggs--to make his reputation with a novel about the criminal mind. Oates has other tawdry secrets--an affair with his sister-in-law, monstrous debts, the legacy of a terrible childhood--but he is protected by the veneer of respectability. Indeed, the thin line between respectability and ruin, the corrupting power of money and the cruelty of class distinctions are themes that Carey rings with adroit authority. As the plot rockets along with surprises at every turn, Carey creates a vivid, multifaceted picture of 1800s London, especially the squalid and tormented lives of the poor and the criminal underclass. The racy, pungent dialogue is faithful to period idioms and to the muscular vulgarity of Cockney slang. Best of all, Carey's memorable characters can stand proudly in the pantheon beside those of Dickens. If one book earns the accolade of ""irresistible'' this year, it should be this novel. (Feb.) FYI: The movie version of Oscar and Lucinda, Carey's Booker Prize-winning novel, will be released in December. Viking will publish a tie-in edition in trade paperback.